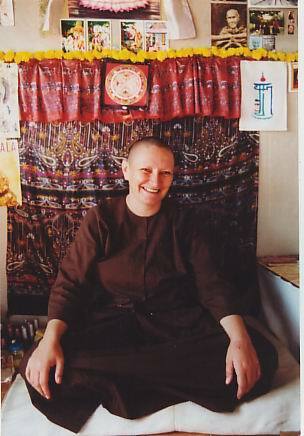 My Life I am Brigitte, an Austrian nun, who has lived here in Thailand since 1989.I was born in 1962. When I was a young child, I liked the stories of God and Jesus and I really wanted to be a good human being.When I became 12 I lost my interest and just wanted to have fun like every teenager. When 20, I met Richard. In 1985 my daughter Melanie Sitara was born and in 1987 my son Patrick Elias. We had a good time together but there where two striking events. My son was born at home and a deep depression followed after his birth for about a month. Every evening I felt a strong fear of death.I feared Richard might die or the kids. It was quite heavy. Later this feeling went away. When Patrick was 8 months old, Richard's grandmother died and again this fear of deathcame up. It seemed to me people are born and die away and there is no refuge, no onecan escape that. It made me depressed. My best friend Andrea suggested to me that I go to a Yogacourse with her. Although I was no spiritual person at all I went with her. At the first Yoga session we did I had my first experience of samadhi. After the exercise we laid down to mindfully relax and I felt as if there was a propeller turning in my throat. It felt as if I was lifted up into space. That was overwhelming. Although I hadexperience with drugs nothing was comparable to that feeling. From thatmoment on I became very interested in spiritual matters. In April 1989 I went to do my first Meditation retreat in Thailand. In those two months of intensive practise I gained some insight into the unsatisfactory, impermanent and non-self nature of our body and mind. This changed my life. I went back to Austria but life there seemed to go on the same oldunwholesome way and I didn't want that anymore. So after two months I went back to Thailand for my next retreat. This time I asked my teacher for permission to bring Richard and the kids with me. The teacher agreed and told me I could become a nun if I liked.That's what I wanted. Going back to Austria I "packed" my kids, some toys and a little money and left Richard, who wasn't able to come with me. I ordained as a nun. My kidsstayed in Thailand for about 9 months. I decided not to disrobe but to stay as a nun forthe rest of my life. Richard really wanted to have his kids back and so I brought themback to their father who since then takes care of them very well. I try to practise as well as I can, trying to share my experience with other foreign meditators, and I share my merit with my teachers, parents, kids, Richard and all sentient beings. 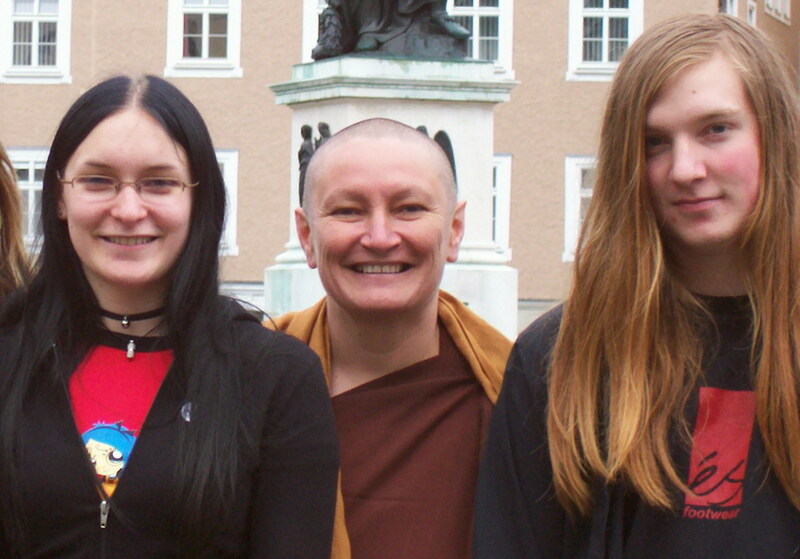 Buddhism for me is no religion - its a life-philosophy. You do not have to depend on aperson or a god. You have to know and experience everything by yourself. The Buddha said: "Do not believe in anyone just because he is a teacher, he speaks eloquently or isotherwise impressive. Do not even believe in my words - just because I said them, buttry to experience everything by yourself. Only if you experience the Dhamma by yourself does it become your wisdom. Belief is only belief, not knowing, not wisdom.If you experience things yourself then no-one can tell you that it is not like that, becauseyou know it from your own experience." This was the main point in Buddhism for me. You don't have to follow a teacher like a sheep follows the shepherd - you have to check it out yourself - is it as he said, or not?! If you cannot experience it by yourself, then it's notyour truth. But of course, you need to try it - check it out. Through skillful instructionsyou can meditate and experience the truth of Dhamma. This is everyone's own job.No one else can do that for you. We are quite lucky because we can still find good meditation masters who have experienced the path. They are excellent teachers andcan give us instructions on how to experience this ourselves. That's very important.You can't get understanding just by reading a book or listening to a teaching. In that wayyou can only get worldly knowledge but no wisdom. You have to practise by yourself.If you really do this, you will have experiences and you will know the truth of Dhamma.It works only that way. Sometimes people ask me about God. Yes - there are gods. Those meditators who developed the divine eye can see them and know that they exist. They believe in them, the way the Buddha taughtabout them. The Buddha knew everything. He had supreme knowledge about the wholeuniverse and he knew about gods. He knew what "created" us. What created us is ourown mind and not a creator outside of us. Check this out by yourself and you will know. There is suffering and there is the cessation of suffering and all of this depends only on your own mind. No one punishes you - you recieve punishment because of your own unskillfuldeeds. No one rewards you - accept you yourself through your skillful deeds, speech and thoughts.Do good - recieve good. Do bad - recieve bad. That's all. There is no god creating this.It's you yourself, with your own mind. It's our own mind which creates everything. If we see this law of cause and effect, we will be cautious, because we understand thatwith every unwholesome action we just cut ourselves. Through that understanding fearfrom doing evil (ottappa) and shame to do evil (hiri) arises in our minds. It's not fear from a god who punishes us. We can understand that every unskillful action leaves a negative imprint on our mind - and sooner or later this has to have it's result which will be suffering. Whereas every wholesome action will result in happiness and prosperity.It's all up to us. We can choose our present and future happiness or suffering. The most important thing the Buddha taught is the cessation of all suffering. It means -no more birth, old age and death. Becoming independent from suffering and happiness -the equanimous, cool mind. This is what we call Nibbana, the cessation of all suffering!There is no other religion teaching this way out of being reborn again and again in thedifferent realms of existence. Of course every religion is good and wants it's followersto be good human beings. If they believe in rebirth they teach them morality, to prevent them to do unwholesomedeeds which drag them down to be born in the suffering realms of hell beings, hungry ghosts or animals. They advise them to do good because this will lead to rebirth ina heavenly realm or at least as a human being. If they don't believe in rebirth they still teach them morality. But where is the way out of this endlesscycle? The Buddha found the way out and because of his infinite compassion he taughtthe way, which is called the eightfold noble path. The Buddha got enlightened about thatthere is suffering. He saw the cause for all the suffering which is attachment and realized it's cessation by eliminating the cause. We can do this by following the path which leads to the cessation of suffering (see eightfold path). This is what the Buddha taught 2500 years ago and inthe meantime millions of his followers attained this path and attained liberation fromsamsara (the endless cycle of birth, old age and death). Now, there are still Noble Onesin this world, who have attained the path, so we are lucky to be able to recieve the identical teaching of the Buddha. We should not waste our life. We should check for ourselves for our own happiness and liberation! 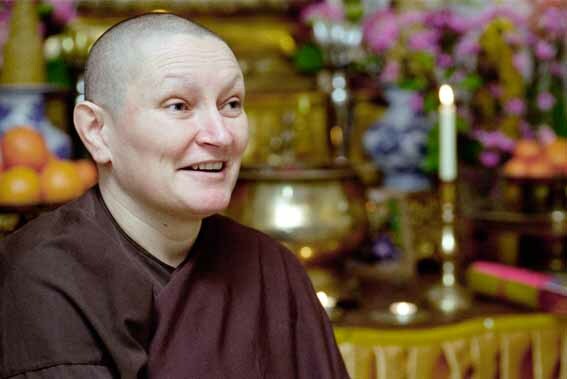 Sometimes people say that those monks and nuns and Practitioners of the Therravada Tradition seemed to work only for themselves. 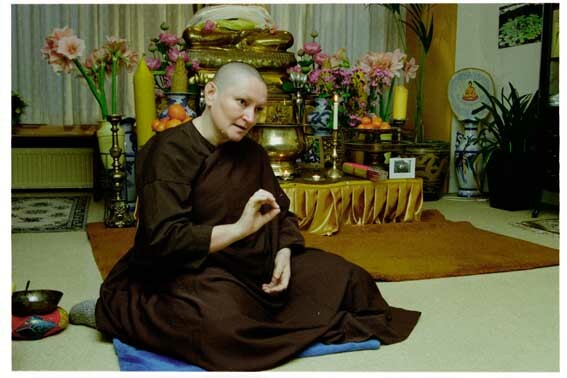 They want to be liberated from the suffering in Samsara and do not care about others. I do not thinkit is like that. Of course we practise to develop wisdom but without compassion there can't be wisdom. I see that every time I am able to make someone happy I do feel much happiness myself. With that happy mind it's easy to meditate. If the mind is unhappy it is very hardto practise. So whatever I can do for other beings happiness - is helping myself. If weget some insight into the suffering nature of Samsara, then we know that this sufferingis not only our own experience but all sentient beings have to experience it. Having the good fortune to have met a teacher who can show us the way outof this suffering - how could we only practise for our own liberation? For me thiswould not be enough. 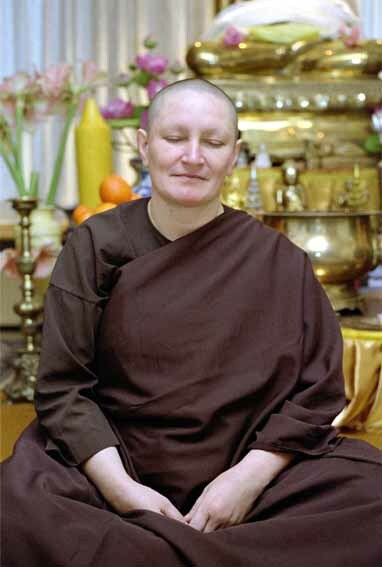 If we have been reborn again and again in Samsara then it seemsto be logical that we used to be related to all sentient beings although we might not yet be able to remember each of those existences. If we contemplate we can see that the person in front of us was our mother in one of our past existences. She was unbelievably kind to us and now she is suffering. We know what it means to suffer and we know how to come out of suffering - how could we not help her? This is an very important part of our practise. Some of my Dhammafriendspractise intensive meditation but they still do not forget about others and everytimethey do their practise they share their merit to teachers, parents, beings dear to them and to all sentient beings. Others help through activities, like caring aboutthose who need it - mentally or physically. Different people have different abilities and so the way they can be helpful for others is different but I think a student of the Buddhawill naturally develop compassion. This is Dhamma - some maybe more some lessbut without compassion there can't be wisdom. I would like to share all the merit that I have accumulated and it's resulting happiness from the past, present and the future to you and all sentient beings. May allbeings develop compassion and wisdom and attain full enlightenment! In Thailand traditionally a Buddhist temple is also a social Institution. In former times young children could study only in the temple - there were no schools. Monks were able to study reading and writing and passed that knowledge on to their students. In these days still many temples provide opportunities for children to study. Another social support temples give is that they provide a place for elderly people to spend their old age in a temple, living with monks and nuns, pracitising meditation, doing their chantings. Most of the elderly people do not recievesupport from social welfare, so they depend on their families. In former times elderly people could stay with their families and were taken care of by the younger generations respectfully. Nowadays the younger people tend to move to big cities like Bangkok, leaving the elder ones behind in the countryside. There are more and more of them who have no one to take care of them in their old age. There are still many poor people in Thailand who cannot afford to buy a coffinfor their dead relatives and people die who have no relatives. 'Vimokkha Social Projects'intend to offer coffins to those who need them. One Tempel who is taking care of HIV infected persons (many of them abandoned by their relatives) needs about 7 to 10 coffinsper day. We used to help this place and others. You could help with your donation. Another project is the nuns community. Although most of the strict forest-tradition temples in Thailand mainly ordain only monks and novices Wat Sanghathan provide place for more than hundred nuns to practise and study the Buddhist teaching. Some do not have much support from their families. We would like to help those who need support that they areable to continue their practise and study. Any donation is welcome to support these projects! Ven. Ajhan Sanong of Wat Sanghathan is planning to build a small hospital and a school for small children. This should help people of Nonthaburi Province to have free medical treatment and education for small children. Any Donation will be of support.